Oh boy, has it been a couple of months in the world of politics! Who would ever have thought that the head of a government would fire the person responsible for heading criminal investigations in order to stop an investigation on himself and the people around him? Who would have thought that the leader of the ruling party would call a snap election after declaring many times that no such election was in the offing, after fears that investigations might topple the government.? Oh yes, it's been quite a roller-coaster year so far for Donald Trump and Theresa May. What? You thought I was talking about our Prime Minister? Now whatever could make you think that? As Joseph Muscat himself keeps pointing out - unlike the stories of Trump firing Comey, the FBI director who helped ensure Clinton did not get into the White House, and Theresa May's 30-plus Conservative MPs who were being investigated over their 2015 election overspend - the stories currently being hashed and rehashed by the Maltese media and the opposition are old news, if they aren’t really fake news. But as we enter the last two weeks of what is, mercifully, a short election campaign, it's good to look back at the last four years and the promises kept and broken. And where better to start than the most prominent one: The Best in Europe. Well what can I say? He wasn't half right. Within weeks of entering the doors of Castille, our PM rolled up his sleeve to ensure that we were not only the best in Europe, but that we would also lead the world. Take, for example, the brouhaha surrounding Trump over the last few weeks over the measly firing of his FBI director Comey. I mean, seriously. If you really mean business you need to do what Dr Muscat did: change your police commissioner at least once a year. That's what really makes you ’strong and stable’ (put that in your pipe and smoke it, Theresa). If you really want to be king of the world, it’s not 30 MPs overspending on their election campaign that you want, it's a clutch full of MPs, close aides, spouses and friends of spouses, "‘making the most of it", as one spouse so aptly put it. If you really want to show them what's what and who's who, you shouldn't be making deals with Russia (too ‘vanilla’) you should choose countries such as Azerbaijan and Montenegro. Now we're talking, Donald! Donald even copied Muscat’s tactics of either cosying up to the media and their bosses (I’m looking at you Breitbart, Fox News and late, not-so-lamented Ailes) or kicked them out of the White House. Speaking of Donald, I must admit that Trump did manage to get one over our Prime Minister. 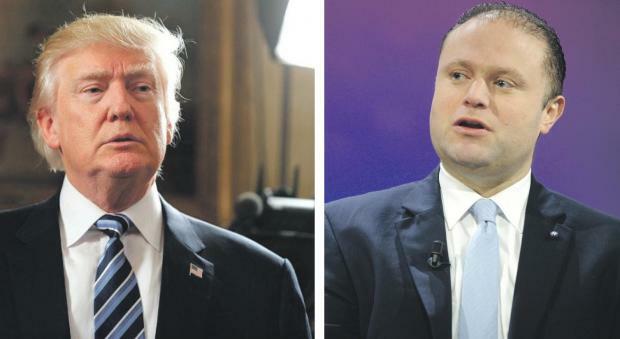 Dr Muscat only managed to hire out his car to the Maltese government, the Don managed to hire out all his golf courses, his aircraft and any other property he could think of to the US government. So it's one up for the Don. But then our PM outsmarted Donald with his spanking new Muscatonomics which, apart from creating an economic boom (forecast way back in 2012, if truth be told), also provided our hard-working politicians and their even more hard-working aides with their just rewards. The Don has only just started in that area, but he's getting there. And let us not forget that the leader of one of the smallest countries in the world now earns the same amount of respect as the leader of the free world. That's not a feat to be laughed at. Come to think of, I sometimes wonder if, in fact, Trump is using Muscat’s playbook - such are the similarities one can observe between these two. Yes. I’m beginning to believe that Muscat has not only delivered on his promises, he has not only delivered on the Best in Europe, he can now rightfully say he is ‘The Best in the World’. Yes Donald - Our Joey has well and truly ‘Trumped’ you !